Your roof has enemies, whether you know it or not. You might not think so. You might think your roof is rather low key. However, make no mistake, your roof is attacked on a daily basis. Following are the 7 most common assailants. Wind. Constant exposure can cause loose shingles and flashing on certain roofs. If you live in a windy area, you want to keep that in mind and choose a proper exterior roofing shingle Snow and Ice. These add a lot of extra weight to your roof, and could cause a potential cave-in if structural issues are not addressed. Beyond that, they can wear away certain types of shingles by moisture seepage or swelling. Rain. If you have an asphalt roof, every time it rains, little pieces of your roof are washed away. This is the grit you find inside your gutters when you clean them. Sun. Heat degrades certain types of shingles. Your roof is exposed to the sun every day. If you live in an area with constant sun and high temps, choose your shingles accordingly. Condensation. Constant temperature fluctuations can create moisture underneath your roof. If you don’t have proper underlayment, you could damage your roof’s decking. However, this type of damage is not as visible as other types. This is why an annual roof inspection is a good idea. Algae and Moss. Besides creating an unsafe, slippery surface should you need to get on the roof, they can also eat away at certain types of roofing shingles. Usually moss and algae growth can be eradicated by consulting with a roofing specialist. Trees. Overgrown branches shed leaves which tend to collect on roof surfaces. 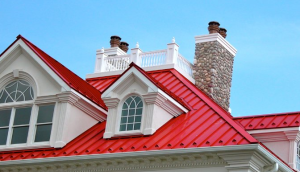 They trap moisture underneath, which ultimately damages your roofing material.